This entry was posted in Uncategorized on June 24, 2014 by Mike Nash. 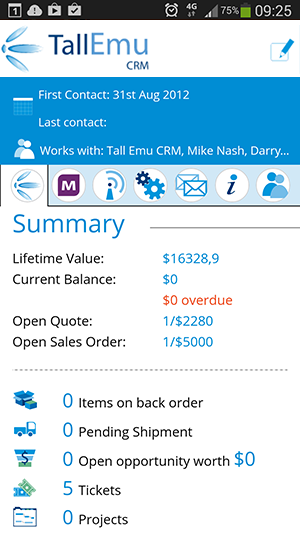 While everyone (including us) is doing end of financial year offers, I thought I would take a break from the sales and update you all on the progress of our mobile CRM. 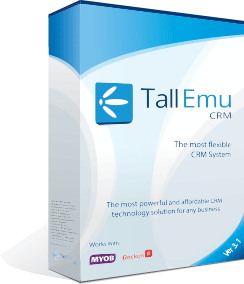 Tall Emu Mobile CRM is much more than just a mobile CRM. 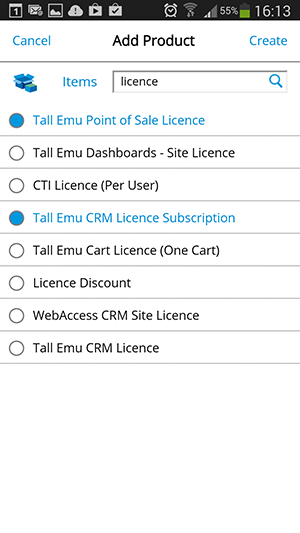 Since Tall Emu CRM links directly to Reckon Accounts, MYOB, EXO and other accounting systems our mobile CRM application lets you access your accounting data while mobile – even if your accounting company doesn’t support it! You can view companies in a neat, concise format – add activities, quotes, and we’re even going to let you take mobile payments as well. We’ve been working hard on this mobile app and it’s now at the stage where I can use it daily as part of my job – so without further ado – I thought I’d share a few screenshots. 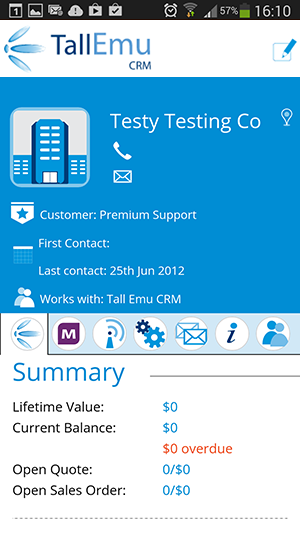 These screenshots were all taken on a Samsung Galaxy S4, running Tall Emu Mobile CRM. This is a pre-release version, and all features, interface and capabilities are indicative only and final release may differ. 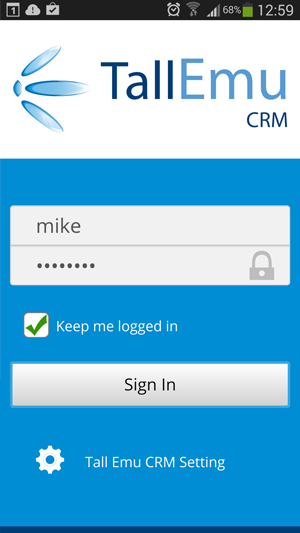 It uses the same username and password as your Tall Emu CRM, and it accesses your data live, from your office. You can use Android, iPhone, Blackberry or windows phones. When I’m logged in, I see the main menu. 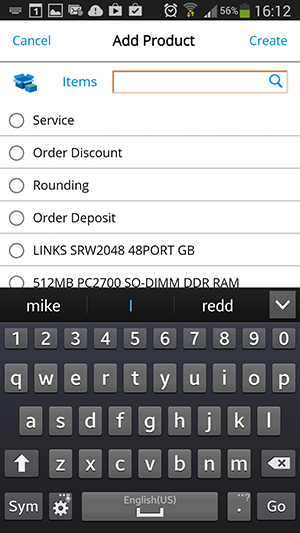 Click on any menu and you’ll go into a list of those items, just like in CRM. You can also search and filter them as well. Each area has it’s own search depending on the type; Companies could be filtered by company name quickly , tasks and events are rapidly accessible by date. Now we’re looking at the company, and if you’ve seen our Inbox 360 Outlook plugin this will be familiar. We have a summary of the company, financials, activities, tasks, communications all neatly buttoned up. We can clearly see the detail if we swipe down – balances, tickets, opportunities and quotes.The other tabs in here expose activities and communications. We can see the list of contacts at this organisation. If we want, we could click on them to get the contact details – we can also filter them easily. The quote list. We can hit the “Plus” sign to add a new quotation. 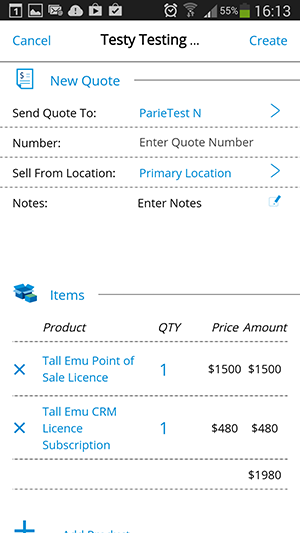 Since Tall Emu CRM links with many accounting systems, all prior quotes are available. The new screen lets us create a quote, decide who to send it to, and what location we are quoting from. 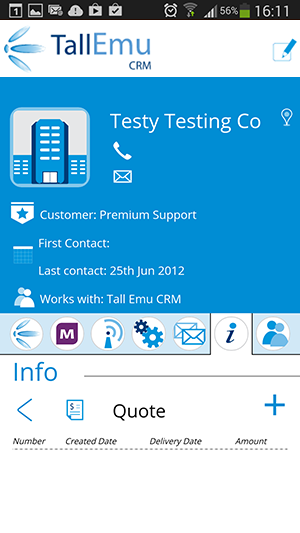 Like CRM, Mobile CRM supports quoting from multiple locations. 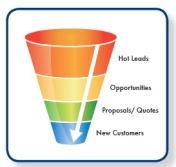 The quote items come right over from CRM. If you’ve linked CRM to Reckon Accounts or MYOB Accountright, the mobile CRM will have all of the products inside it right away. 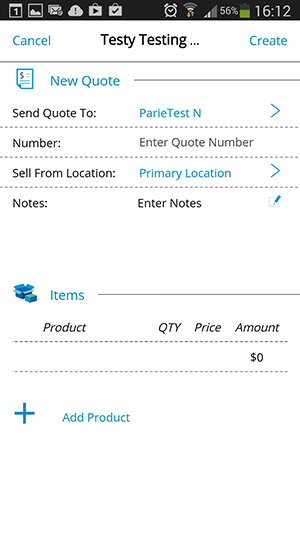 When we are adding items, with a big product list we can filter easily and we could add more than one item at a time to the quote. We’re shooting for ease of use and really trying to consider the small form-factor screens. The quote now has a few items on it. We can click on the create button to save it; we’ll be able to email the quote to the user, get them to sign off on the quote too – all from the mobile device.